John Paulson may have made been the subject of the book "The Greatest Trade Ever" about his shorting of (residential) mortgage-backed securities, but that trade was as typical for him as Michael Steinhardt going long U.S. Treasuries in 1981. Steinhardt was an analytical equity investor betting his reputation on an unfamiliar asset class in government bonds. Paulson's deep experience was in something else too*. 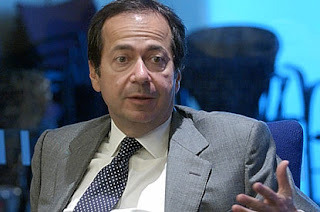 John Paulson's professional background is in mergers and acquisitions, and so it was natural that the investment strategy in which he came to specialise was risk arbitrage, first with Bear Stearns and then Gruss Partners, before he opened his eponymous firm. As with many practitioners who go on to play other stages of the event cycle, risk arbitrage led to exposure to distressed bonds, and eventually to the full panoply of event investing of divestitures, recapitalizations and other company reorganizations and financings. So it is the associated specialism of activist investing that is covered here with John Paulson. This is a written form of a presentation he made a few years ago on the topic . Whilst the principles of what John Paulson describes are still valid, the aftermath of the Credit Crunch makes comments on real estate and banking anachronistic in today's market conditions. Paulson & Company is an event arbitrage firm, and we have been in business 15 years and activist investing is not our only activity but is in an important part of our investment strategies. I'm going to talk today about the benefits of activism. Activism is good for the stock market. It is good for investors and is also good for business and is good for corporate governance. One: The first benefit, and primary benefit, of activism is to increase shareholder value. We get involved when a stock is trading at a discount to its true value. Through activist strategies we seek to realise that value. Two: The second goal, and as important as realising shareholder value, is to improve corporate governance. Unfortunately there are situations where corporate Boards or managements don't always act in the best interests of the stockholders. Activists make sure that all shareholders are treated fairly and properly. Three: Another benefit is that activist investing carries out a role on behalf of other investors. We might have to act alone, and we might own only 5 or 10% of a company, but when he share price goes up all investors in the company benefit. That helps individual investors who don't have the time or resources to act in this way. It also benefits pension funds and other institutional investors that can't get involved for political reasons or because it is outside their mandate. But I would say that in many if not most of the situations in which we get involved we are clearly getting the support of institutional investors. Even if they are somewhat constrained in coming out and saying so publicly, they are supportive of the goals we are trying to achieve. Four: Activism keeps management and boards focussed on shareholders' interests. Prior to activist investing Boards acted in their own interests. It used to be that the only thing shareholders could do when they didn't agree with what was going was to sell the stock. Activism gives shareholders a voice, and makes management listen. I believe it also creates companies stronger. Many times what leads to an activist situation is where a company management is pursuing a strategy that that they are reluctant to let go of. Shedding loss-making operations and merging with other companies to get to global scale, in the end, does result in stronger, more competitive and more profitable companies. Five: Activist investing also removes inertia. You can't just accept the status quo. If management have been doing something for a long time and are happy with it, that is not good enough. Management have to be accountable and activist investors showing up forces management to be accountable. Why is There a Need for Activism? The primary reason for activism is that in public companies there can be divergent interests between owners of the business and management. In many public companies, particularly in cases of very old, established companies, the board members and management frequently own de minimis amounts of stock. So their decision-making criteria for running the company are other than those which are best for company shareholders. Frequently they are focussed on the perks of running a large public corporation. Many times they like their cushy jobs, they like all their perks and the prestige that go along with the positions they hold. Ideally the Boards want to be left to run the company - they view shareholders as bothersome. In some of the old companies the Boards can become very insular. Many times the Boards don't have any stock at all. They are reluctant to incorporate change. Then there is a need for an activist to get involved. If the company is doing the right thing, the shares are trading at a full value and the shares are trading at a high P/E, then there is no need for an activist to get involved. However if it is trading at 50% discount to fair value, if it is pursuing strategies that have failed, if it is under-performing and the sum-of-the-parts is at premium to current traded values then that attracts the activist investor. There have to be readily implementable strategic alternatives to unlock that value (some examples will follow). So we look for a discount and a situation where if management took action that discount could be quickly eliminated. Typically the management has been reluctant to act, simply because they don't want to change things. The activist investor comes in and acts as a positive catalyst for positive change. Why Would the Company be Under-valued? Why would a company be undervalued to the extent that an activist could get involved? The most common reason is that the company is in disparate businesses. Some of the businesses are weaker than the others. The sum of parts is greater than the value of the whole, and the remedial strategies are not always seen as readily implementable. The sum of the parts was greater than the whole. Take as an example Cadbury Schweppes. In the U.S. beverage business it was an also-ran in market share, but it had an attractive confectionary business. Combined as a public company they traded at a discount to the fair value. Sainsbury's had very valuable real estate and the management was reluctant to separate that real estate element from the retail operations. It traded at a big discount to the asset value of the business. (Property investor) Robert Tchenguiz showed up on the share register and highlighted that differential, and the stock appreciated significantly. In (Dutch company) Stork – another situation where they were in many disparate businesses - people that wanted the individual businesses didn't want the whole rag-bag of businesses, and as a consequence the shares traded at a very significant discount. Then there are situations where the track-record of the management is poor. Though there are pieces of the company that are valuable, investors lose confidence in the management, and as a result don't attach a high multiple to the stock. Two situations come to mind – Ahold from Holland and ABN AMRO, the Dutch bank. Both companies, for different reasons, had underperformed in stock market. There were actions that could be taken to highlight the value, but the managements needed some pressure from shareholders to do something about it. We also see situations where managements are not focussed on shareholder value. It could be through no fault of management, but that the private market value is very different from the public market value. A ready example is the real estate sector. Real estate can be capitalised at very high multiples of cash-flow, but generally the public market looks at multiples of earnings. You can't get full value for real estate assets in the public market. So for example, Ahold had a fair amount of real estate and the shares traded at approximately 7 ½ x EBITDA. Yet real estate transactions are being done at over 20x EBITDA. So put the real estate in a public company and the market gives it 7 ½; separate the real estate, sell it to someone privately, and you can get 20x. Some deals were done recently at approaching 24x EBITDA. The latter deals had cap rates as low as three and a half percent. That is the incentive - the difference between public and private valuations. For the retailers it is not necessarily a problem of management, but a difference in value can be realised through re-structuring, tax treatments and other considerations. Many people see that activism has to be confrontational. That is not the case - some of our best investments have been where we have been working together with management, outside of the public eye, to enhance value. For example, a fund was written up in the newspaper yesterday: Blue Harbour is an activist investor that only does friendly transactions. They buy a stake in situations which are under-valued, and where they believe strategic re-structuring will add value, and then they work with management collaboratively to achieve that goal. We have worked with managements at Ahold and The Mirant Corporation constructively. Actions the management have taken have added value in both cases. In Cadbury and Laidlaw we have worked in a non-confrontational manner. Generally it is important for management to listen to shareholder concerns: when investors make a point that is valid, it is up to management to respond to those concerns and help to realise that value. In the ideal situation, you take a stake and management greet you with open arms, and you agree to enhance shareholder value, but sometimes management is very confrontational. Sometimes the Board and management don't like being told what to do, and the management take action which harms shareholder value. I will refer to two recent examples. After ABN AMRO granted exclusive negotiating rights with Barclays, RBS indicated an interest to pursue an acquisition. ABN AMRO management said they couldn't negotiate with RBS because of the exclusivity agreement with Barclays. That exclusivity period expired, and even knowing the RBS interest, ABN AMRO management then extended that exclusivity period. They used that second period to negotiate what was effectively a poison pill: they arrange to sell the prize asset which RBS was after (LaSalle Bank) to Bank of America. This made it almost impossible for RBS to pursue the deal they wanted with ABN AMRO. ABN AMRO was refusing a deal at a higher price so they could choose the buyer that they wanted to sell to. This was done though many shareholders in ABN AMRO did not want this to happen. This is thankfully rare, where management use scorched-earth tactics to destroy value in order to serve their own interests. Thankfully ABN AMRO were taken to court by Dutch shareholder group, VEB, and the shareholder group won. In order to sell even some of the the assets ABN AMRO management needed shareholder approval. Without that activism on the part of the Dutch shareholders association the incremental value in the asset sale would not have been realized. Another hostile situation where were involved was Stork – this was a deeply undervalued businesses on a sum-of-the-parts basis. It traded at a 50% discount to fair value of the component parts on a peer group public company basis. It was in chicken processing, aerospace, oil services, and believe it or not scores of other businesses at well. So there could no corporate buyers of the whole company, because buyers of oil services did not want a chicken business. We believed the best and most promising business in the group was aerospace. We suggested either splitting into three businesses or building the group around the core aerospace business. The Board refused to listen to us, even though we owned up to 35% of the shares, and the Board owned no stock. We said that that was unfair, and let's put it to a shareholder vote. At the shareholder meeting 89% of the votes at that meeting were for the change in strategy. The Board refused to listen to the voice of the meeting and said the Board make strategy not shareholders. So we called another meeting to replace the Board. To deny our rights the Board then initiated a poison pill – issuing super voting preferred stock to themselves. The preferred would represent the majority of votes if the issue was allowed. We had to take the company court. We argued that the poison pill was originally put in place to stop an unwarranted takeover, not to prevent shareholders from voting. The court agreed with us and threw out the pill. We are now in the process of trying to negotiate something with Stork. Our preference is always to do something collaboratively rather than confrontationally, but unfortunately it doesn't always work out that way. And we have to act to protect our interests on those occasions. Cadbury – a great company. In two businesses: it is a world leader in confectionary, but also had a substantial but sub-scale drinks business. Everyone knew that it was in the interests of shareholders that the businesses split – the best strategy was thought to be to sell the drinks businesses and concentrate on confectionary. Once Nelson Peltz declared his stake management realized the logic and immediately announced they would consider separation of the businesses. The stock jumped almost 40% in a few months of the announcement of the split of the businesses. Incidentally Nelson Peltz had good knowledge of the situation as he had sold Snapple Beverages to Cadbury five years previously. ABN AMRO – over the five years prior to the involvement of the The Childrens' Investment Fund the stock had moved sideways whilst the banking sector was up substantially. ABN AMRO share appreciated 40% in a few months after the TCI stake became public knowledge. This shows the benefit of an activist stirring the pot. Shareholders had been disgruntled with ABN AMRO management for some time. It was a big bank, but it had pursued a strategy of being a small player in a lot of different markets. It was one of the largest banks in the world, but it had a tiny operation in the U.S., it had small operations in Italy, in Brazil, and the Middle East. That situation does not create operational strength, or allow for synergies, or allow for expanded margins. Contrast that with those banks that had large shares of deposits in its markets. Large shares of deposits in a banking market leads to profitability, so although ABN AMRO had grown it had not created value. Ahold – the re-structuring activity in Ahold took the shares up 50% at the same time that the retail index was up 5%. The company does well operationally in Holland and Sweden but poorly in the US. As a consequence the shares traded at a discount to the sum of the parts. We proposed selling off or spinning-out the under-performing US operations, to focus on the successful European operations. We believed that that would create shareholder value. They were responsive. They sold off the US food service operations, and received much more than anyone expected – some $7bn. They bought back stock with the proceeds. The story doesn't end there because management are considering other initiatives which came from the activist shareholders. We have met with management and they have listened. The Mirant Corporation - a very successful situation as the shares are up over 100% in a year, and Paulson & Company was the largest shareholder. Mirant, an Atlanta-based power company, itself had come out of bankruptcy and had a new CEO. They announced that they wanted to buy another utility with stock, but their own shares were trading at a discount to the sum-of the-parts, and they were proposing to acquire the target company at a premium. It was a very dilutive acquisition proposal. The proposal drew very sharp criticism from nearly all the existing Mirant shareholders. Ed Muller, the CEO, was surprised, but he listened to shareholders, and dropped the proposal within a week. He then reached out to shareholders, and met with us and other large shareholders individually. We explained that we thought they should do is sell off their non-core assets and concentrate on the Mid-Atlantic utility business. Rather like ABN AMRO they had bits of businesses all over the place. It had utilities in the Philippines, Jamaica, Trinidad and Tobago, and the Bahamas and in the U.S. in Texas, in California and in other states. After meeting with us he realized that the best thing to do was to hire bankers and sell off the widespread operations, and concentrate on the core utility business. He sold the Philippines assets to Tokyo Electric; he sold the Caribbean assets to Marubeni; he sold the non-core US assets to a private equity group. It was our most successful activist position, and it was done with a collaborative approach to management. *Before he began his investment career, John Paulson accumulated academic distinctions. He was Valedictorian of his class at New York University's College of Business and Public Administration and received his MBA from Harvard Business School as a Baker Scholar, the school's distinction for the class' top students. After a stint as a management consultant with the Boston Consulting Group, he joined Odyssey Partners as an Associate and moved on to Bear Stearns in 1984 where he became a Managing Director in mergers and acquisitions. In 1988, he became a general partner of Gruss Partners. In 1994, he started Paulson Partners L.P., and in 1996, Paulson International Ltd., a companion offshore fund. In 2001, the firm launched a leveraged version of its funds. Based in New York, Paulson & Co. currently manages $33.6bn, up from $700 million in July 2003.